Have a Bunch of New Clients? Bulk Import Them. Sometimes coaches request to bulk onboard new clients into CoachAccountable. This can happen with a new account (when a company switches all its coachees over to CoachAccountable), or when a new program starts (suddenly 45 people in the cohort need to be added by Wednesday, help!). Adding a client the usual way is pretty quick, but going one by one can get tedious when you’ve got more than a handful. However, if you’re handy with a spreadsheet you can get all of their information in line and import it all with just a few clicks. 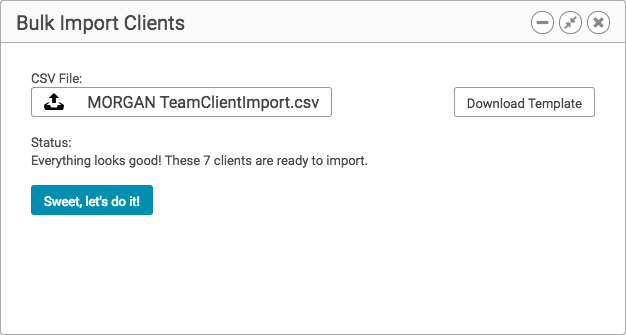 1) Bring up the client adder as usual by clicking the +Client button. In the lower right, click on the “Bulk Import…” button. 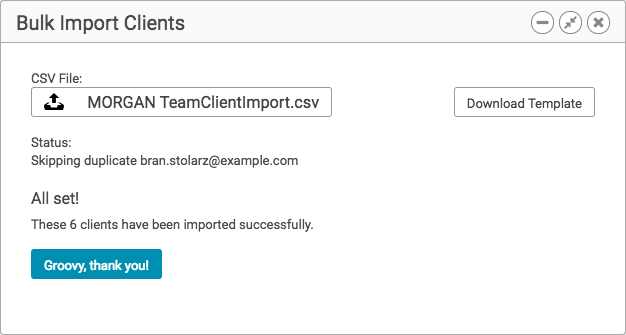 3) In the template, add rows and enter in client information to your heart’s desire. Commonly you will already have some sort of spreadsheet of client data that you are working from. Filling in the template will commonly be a matter of copy-and-pasting over various key columns. Note: the only required fields are firstName and email. 4) When you’re done save out the file. Be certain you save it as a .csv file, .xlsx or .numbers files WILL NOT WORK. 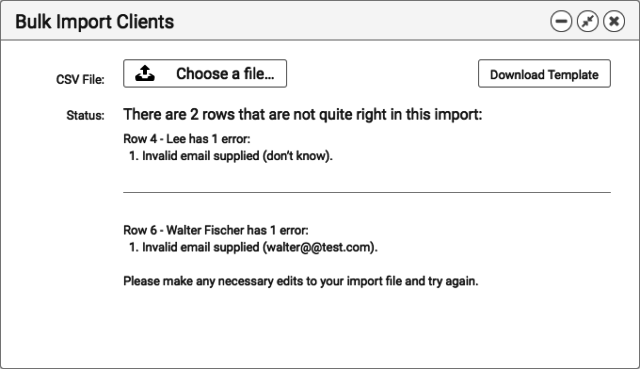 5) Choose your .csv file as the one you want to import. 5) Observe the status of your data that’s loaded for import. If everything looks good, dance victoriously. The system is smart enough to know when something’s messed up. For instance, it’ll throw an error if the email address is invalid. No, you can’t write “don’t know” for someone’s email address. 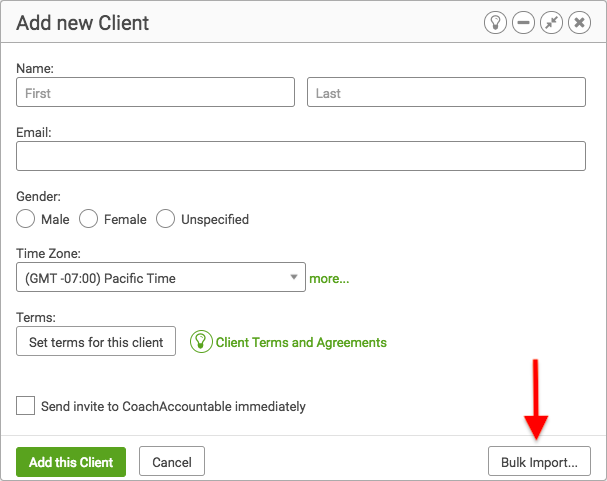 Also, if you add a client who’s already in your account, CoachAccountable will notice and let you know that person won’t be added (this helps avoid paying for clients twice, too). You’re new to CoachAccountable and want to add your entire roster at once. You want to transfer a bunch of clients from your CRM (InfusionSoft, Insightly, Hubspot, etc.) along with their relevant details. A new coach joins your organization and brings his/her clients. Were you dreading the thought of inputting all your clients? Did that keep you from signing up for CoachAccountable? Fret no more and take advantage of our 30-day free trial. More recently: Happy Birthday CA! Let’s Recap Year Six.